For his second solo exhibition at KÖNIG GALERIE, Nathan Hylden shows large scale paintings on aluminum and canvas, as well as new sculptures. All works can be seen as parts of an ongoing painting project that explores questions regarding the pictorial process and the relationship of an image to its material manifestation in space. A photograph of a blank vertical canvas is the starting point for the aluminum paintings. 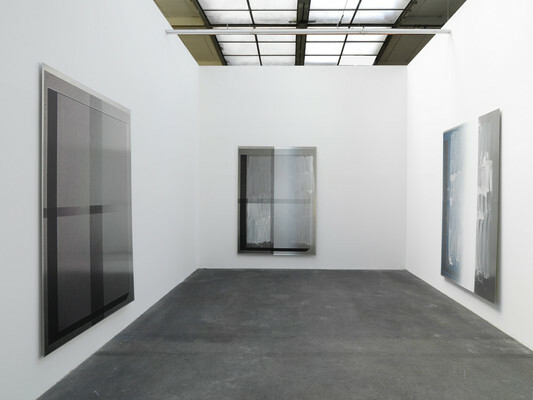 After being translated into an enlarged dot pattern, the 1:1 scale photograph was fragmented into four identical parts. The following steps vary: in a continuously changing order or “shuffle”, Hylden applies different layers of paint on the aluminum sheets using a brush, screen-print and airbrush. With a wide brush and energetic flow he applies white acrylic paint, produces washes of metallic-silver layers and screen-prints the pieces of the canvas photographs with black. The enlarged dot pattern print abstracts the image further and dissolves it in an optical effect. During the production of this series, Hylden constantly combines not only the steps in the work process but also works on more than one painting at a time, overlapping the aluminum sheets to create different layers and spraying them with paint. From one painting in the series to the other, what can be perceived as the potential ground thus constantly shifts – figuratively and literally.For the works on canvas, Hylden uses the same method, as is typical for his work. The paintings are organized into groups and then separated into independent works. First, all canvases are primed in black and covered with a wash layer of metallic silver paint. They are then vertically placed on each other and sprayed over with red, blue, violet and finally a matte black. 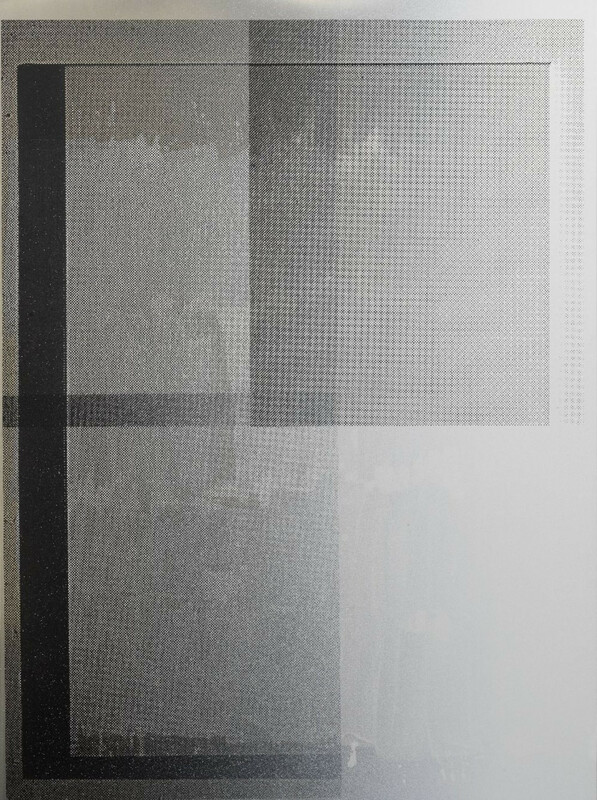 Optically retracting from the underlying layers of color, this final layer of black appears as an empty field, a void. The simultaneous work on the paintings provokes a deductive understanding of the painting's structure. Each painting is at the same time a starting point and the result of another one. It is as much the positive as the negative form and thus another's index. On the other hand, each one remains an autonomous object. This way of working on the part of the artist leads to an investigation of cause and effect in artistic production. Hylden further explores this working technique in the series of sculptures. Each of the shoulder-high objects consists of two mirror polished stainless steel sheets, folded at an angle and placed parallel to each other. The sheets in front show cutouts, through which black paint has been sprayed through and onto the sheet behind. Hence, a stencil-like image appears. The cutouts are derived from a photograph the artist took in his studio in Los Angeles, depicting the paintings for the Berlin show. If the sculptures were to be “unfolded“, it would be possible to recognize a row of classically hung paintings in linear perspective. 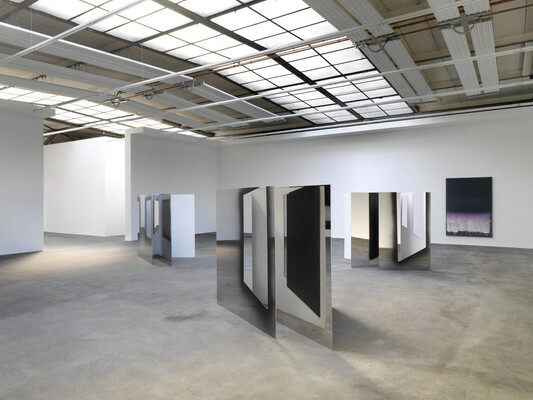 Additionally, the sculptures' surfaces mirror the paintings in the gallery space. They are thus present both as material objects and as image-producing surfaces. 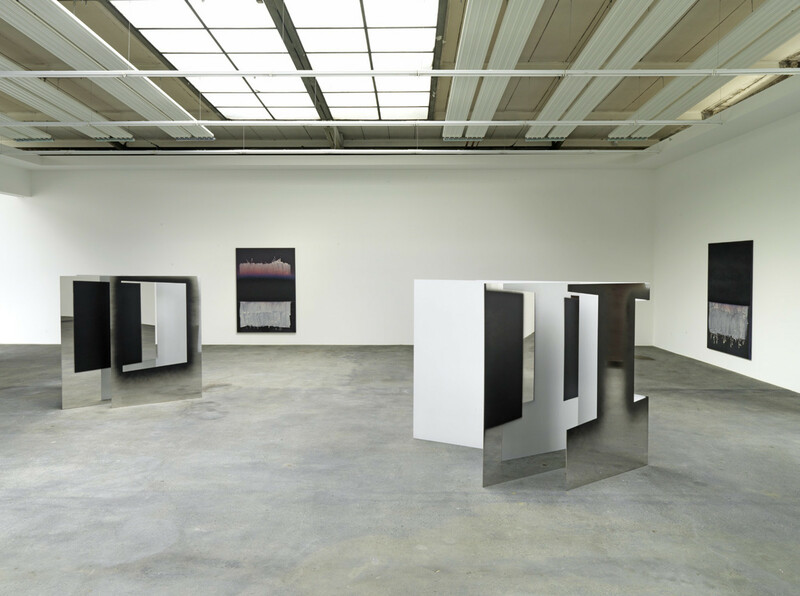 Again as with Hylden’s other exhibitions this marks one part of a continuous exploration where the terms of cause, effect, presence, and completion are obscured through the very means of the process itself.